The basic design is two sheets of 1/4″ acrylic separated by a 2″ wide piece of wood and two 2″ standoffs. The stepper motor mounts on one side and uses two timing pulleys to reduce the speed and increase the torque on the final V-Belt pulley. The V-Pulley is used to windup or release string that is connected to the object being lifted. The goal of this version of the design to allow the drive system to be mounted in almost any direction and not have the sting/wire coming off the V-Pulley get caught or rub on edges. The axle for the larger timing pulley and V-Belt pulley is mounted on two bronze sleeve bearing to reduce the wear and tear on the acrylic sheets and provide a smoother running surface. This axle is a D-Profile axle to allow a good grip by the set screws and prevent the pulleys from slipping under hi-load conditions. 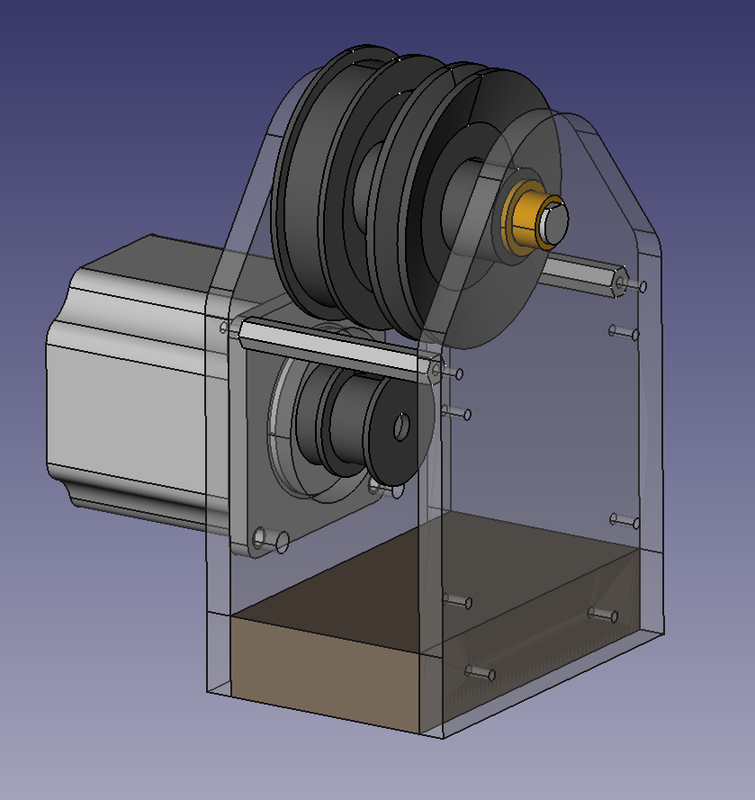 The shaft of the stepper motor was also ground down to provide a D-Profile, again to prevent the pulley from slipping. On the side opposite the motor there are four mounting holes to provide a place for the AutoDriver and shield to be mounted. Below in a list of the major mechanical parts required to build a single drive system. 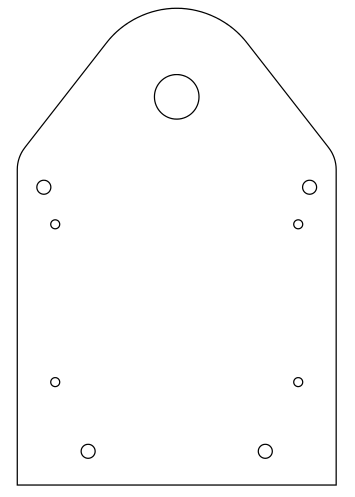 This is the templates used to cut out the 1/4″ acrylic sheet for the side that will have the AutoDriver and shield attached to it. Click the images below to download the original, to scale, vector files. Templates for board side acrylic sheet. 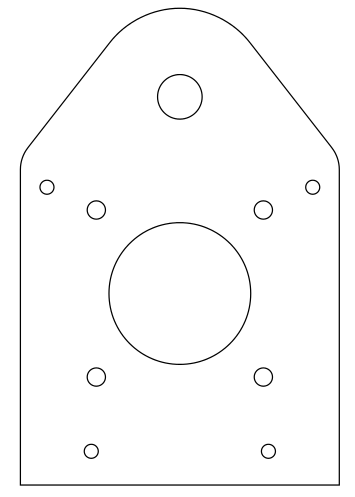 The template for the side that will have the stepper motor bolted to it. Templates for motor side acrylic sheet. And finally the assembled version, along with AutoDriver and shield. Assembled timing belt drive system. 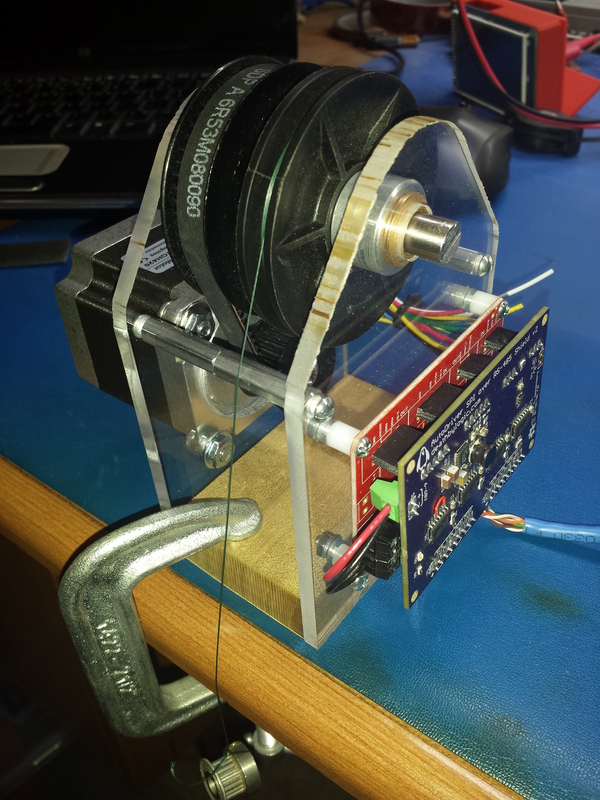 This entry was posted in Large Scale Delta and tagged Mechanical, Stepper Motor, Timing Pulley by Daniel. Bookmark the permalink. First of all. Amazing work. I just wanted to know what software did you use to make this model. And that can it simulate mechanical models for testing? I used FreeCAD to make the model. It’s a little buggy at times and crashes fairly often but it’s free so I put up with it. The only simulation capabilities I am aware of is a robot simulator, which i assume is capable of simulating movement between different mechanical parts.